Schweinfurt. Der Tag nach diese Artikle,… jedem stood and schaut! Der Power of the Press. 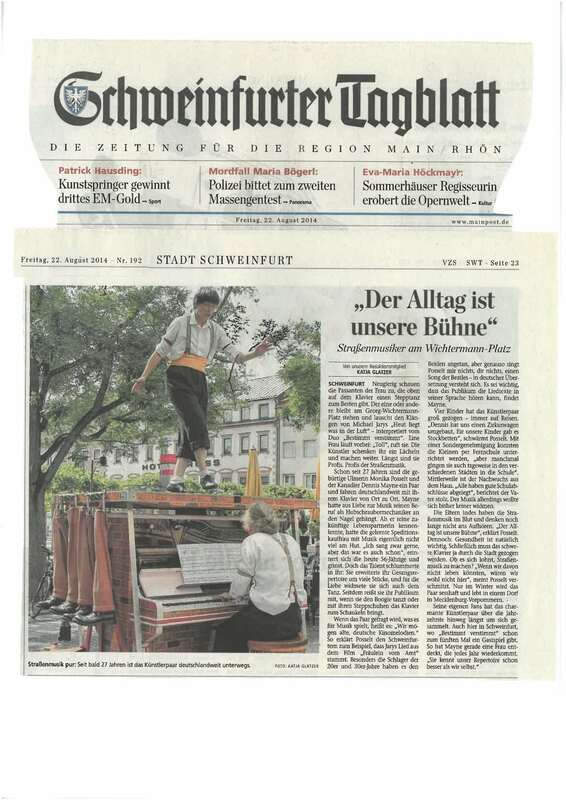 Schweinfurt pedestrians curiously watch the lady, tap-dancing on top of a piano. One after the other, stand and listens to Michael Jary‘s song There‘s Something in the Air Today. Interpreted by the duo Bestimmt Verstimmt (Definately-out-of-Tune). A woman, passing by, shouts: “Great!”. The Artists give her a smile and continue. They have long been pro‘s. Professionals of street music. For more than 27 years, Monika Posselt, who was born in Ulm; and partner, the Canadian Dennis Mayne; drive from one German town to the next, with their piano. Dennis hung his profession as a helicopter-mechanic on a nail, out of love to music. When he met his future partner, she didn‘t have much to do with music! “I liked to sing, and that was it”, the now 56 year old remembers with a grin. Her talent was snoozing inside of her. She now has an extended repertoire of many pieces. And “out of love”, she added dancing. “Dennis wanted some Tap-dance….” Now, she tears her audience with, when she dances a boogie-woogie,..or makes the piano sway, with her tap shoes. Asked, what kind of music they play? 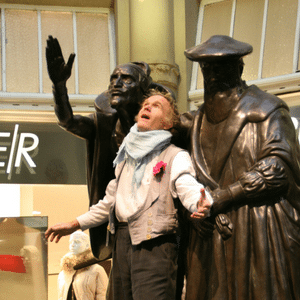 They answer: “We like melodies from old German movies.“ So the Schweinfurters get explained, “Michael Jary‘s song stems from the movie, The Fraulein from the City-hall . They prefer hits of the `20-ies and`30-ies; but at the same time, Monika interpretes a Beatles´ tune,…translated into German naturally. When I´m 64. It is important for Dennis, that his audience is able to hear the songtexts in their own language. Four children have been raised by the Artists – while travelling. “We built for us, a wooden Circus-waggon. Our children slept in bunk-beds”, Monika recalls. They aquired a special permission to home-school their children by correspondence courses. “Ocasionally, they visited local public schools for a day or two.” Meanwhile, the off-spring is out of the house,..waggon. “They finished school with very good grades“, their father proudly reports. However, none of them jumped into music until now. Street-music cooks in the parents blood, however. And they don‘t even think about it coming to an end. “The day-to-day life is our stage”, Monika declares. “Nevertheless, health is equally important. This heavy piano must be pushed through the city.” Whether it is worthwile to make music on the streets? “If we wouldn‘t be able to live from it, we wouldn´t be here”. In the winter-time the couple sits still, and lives in a village in Mecklenburg-Vorpommern.